Buying a home entails more than just inspecting the house if you are a gardening enthusiast. For example, the presence of wetland plants in the yard could signal not only drainage difficulties but also the potential for less obvious problems. Wetlands are just one red flag to look for outside of the house to ensure that your landscaping future on your new property will be a happy one. Many older houses were built before wetlands legislation began inhibiting house construction on wetlands. While such houses are themselves grandfathered in, be aware that you may not be able to work the land they sit on in the fashion that your grandfather would have. A building inspector can now restrict you from doing something as seemingly harmless as creating a brush pile on a portion of your land considered wetland. Don't presume, then, that just because your name will be on the deed to such land, you'll necessarily be able to do whatever you desire there in the way of landscaping. It's important to understand, too, the difference between "wetlands" and "swamps." When buying a house, you may see a swamp on the neighbor's land and be tempted to think, "Oh, I'm in the clear: The swamp is on the neighbor's side." The reality, however, is that, no, you're not necessarily in the clear. The "wetland" may not end where the water ends; rather, it may continue as far as the wetland plants extend. 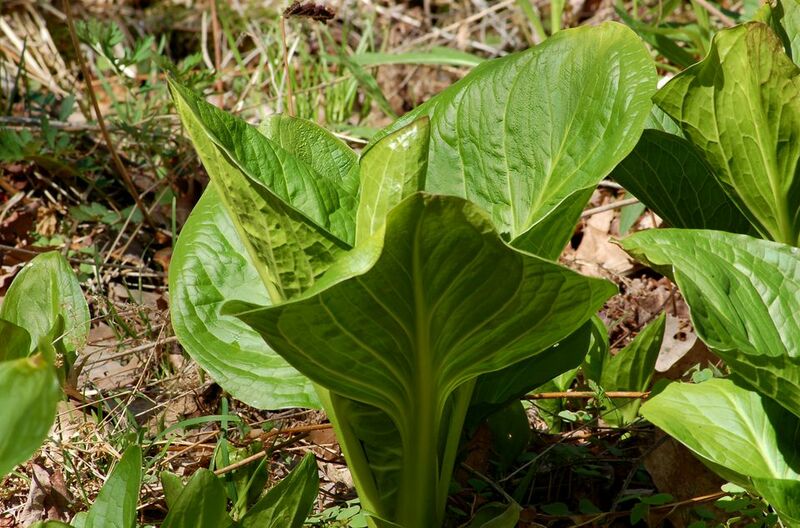 That's why it's important to be able to identify wetland plants such as skunk cabbage (Symplocarpus foetidus) when buying a house. Consider, too, that laws change, and the officers who enforce those laws come and go. So just because people get the OK to do such and such on wetlands today, that doesn't mean you'll necessarily have the same right tomorrow. It's a good bet that, in some regions, wetland laws will, in the future, become more robust and be enforced more rigorously than they are currently. Sure to make any thorough list of invasive plants, Japanese knotweed will spread to form a monoculture, effectively suppressing all competition and making the land unusable. It's not a small, inconspicuous weed: It can reach 10 feet tall. When the current year's vegetation dies back in autumn, it leaves behind ugly canes that can persist for years. Each new year's crop adds to this unsightly jungle, as new canes push up to fill the spaces in between the old ones. It's a tougher weed to get rid of than just about any other. Yes, it's possible to get rid of this weed, but only if you're willing to take the task on as a new hobby. The presence of such weeds on a property should lower its purchase price because, in calculating the total cost for the property, you should include the time, trouble, and money required to eradicate it. In fact, in the U.K., the presence of Japanese knotweed does affect real estate purchases. According to Karen Platt, well-known for her work with black plants, "no mortgage lender will lend on a property that has untreated Japanese knotweed." If you've never lived on a steep hill, you may not appreciate how much living in such an environment can negatively impact your quality of life, especially if you plan on growing plants. Hillside landscaping presents some unique challenges, and you should take those challenges into account before buying real estate situated on a hillside. In addition, take into account that many other landscaping tasks will be three times as difficult to accomplish on a hillside as would otherwise be the case (for instance, pushing a wheelbarrow around to move mulch, soil, etc.). And be prepared to chase after rounded objects that have rolled downhill on you, like plastic pots and balls of twine, constantly. If you find yourself unable to resist the views from a hillside property, building retaining walls may allow you to garden on terraces while enjoying spectacular vistas. But, again, the time, trouble, and money needed to build such structures should be factored in when you're considering buying hilly property. If you've always had big dreams of creating your own backyard oasis, a retreat tailored to what you want and not governed by someone else's landscaping rules, then you ignore the potential for problems caused by homeowners' associations only at your own peril. About one American in six lives where such associations make the rules. They have their good and bad points. Homeowners' associations do help keep property values up. But, if you don't want somebody telling you that you're letting your grass get too tall or that you're being too pokey about finishing up a DIY landscaping project, then buying a home where a homeowners' association rules isn't a good idea. Despite the oft-spoken dictum, "Good fences make good neighbors," the fact remains that truly bad neighbors may still find a way to intrude upon the serenity of your backyard oasis and diminish your enjoyment of the great outdoors, even with the best of fences. That's why good neighbors are better than good fences. The "neighbor factor" is especially pertinent to those who enjoy working in the yard. The more time you'll be spending outside in your new yard, the more you'll be exposing your life to your neighbors. While you can gain some privacy from neighbors by building privacy screens, be forewarned that the worst types of neighbors would find a way to bother you even if your two yards were separated by the Great Wall of China. Fences, after all, can be circumvented, unless you wish to barricade your property and live like a hermit. So it pays to interview your prospective neighbors before buying a house. If you see any of them out in their yards, offer a friendly hello, and try to get a quick read on their personalities. If the neighbors complain about how messy the pine trees are next door, they could be chronic complainers. No tree is completely mess-free. The most you can hope for are trees that are relatively clean, such as Canadian hemlock trees. During the whole conversation, they're yelling at their kids. If the kids pay them no mind, then they won't pay you any mind either when they start running through your yard. Their dogs are barking during the entire interview. You won't be able to stand this over the long haul if you value peace and quiet. If the neighbors don't seem to listen when you're speaking, interrupting you in mid-sentence and failing to answer direct questions, this is a warning sign that they're poor listeners. Poor listeners will often pay you a visit and "talk your ear off." They're not in tune with what others are feeling and are lousy at taking a hint, so they're likely to keep you from doing what you came out into the yard intending to do. Friendly, two-way chats with compatible neighbors are wonderful, especially if they, too, love gardening and nature. Such chats build happy communities. But bad neighbors are another story altogether. Do you really want to have to steal furtively out of your house or barricade your property just to enjoy a tranquil moment in your own backyard oasis? The ideal is to have great neighbors who won't spoil your backyard fun. Hopefully, if you build a fence, you will do so not out of a desperate need to isolate yourself from the neighbors but because a fence can be just the design element you need to perfect the landscaping along your property line.